Testimonials — Why Use a Seattle Slug? 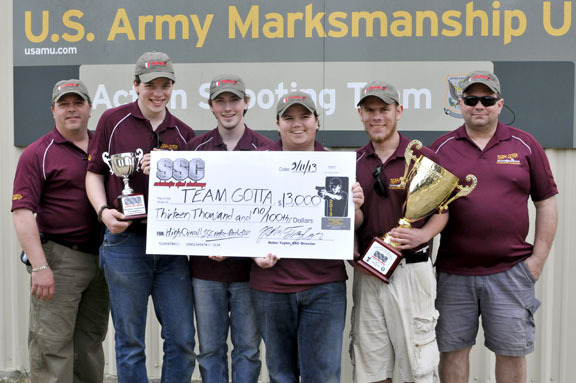 On May 21, Team Gotta and Custer Sportsmens Club hosted the largest SASP match ever held in Washington State. Eleven squads from four organizations competed, posting some truly excellent times. The Renton Steel Dragons’ Varsity Team (High School students all) not only won the match, they broke the course record established by Team Gotta this summer. Renton’s top gun Christian Sailer ran neck-and-neck with Team Gotta’s captain Jake Overstreet. Sailer set the NATIONAL individual course record (36.11) with Overstreet just 1/3 of a second behind (36.34). For a sense of scale, perhaps 20 people nationally have broken the 40-second mark — and that’s being generous. Only three have shot 36-second scores — Sailer and Overstreet among them! The overall match welcomed a mix of adults and students for a total of 91 entries. 41 more entered the bowling pin side shoot, making this both the largest steel match and the largest pin shoot held at Custer Sportsmens Club in the last several years. Team Gotta Victorious at Oregon State — Naomi McKay Top Scorer! Team Gotta took two teams to Oregon in April, vying against the Renton Steel Dragons, and match host Wheeler County Rangers. Gotta ran two “Open” teams (mixed high school and middle school), and found itself carried to victory in large measure by a demure 8th grader named Naomi McKay. McKay led Team Gotta’s varsity group not on brute speed, but on efficiency. Her final score of 42.93 seconds is, unofficially, the fastest on record ever fired by a middle school student. Wheeler County’s Austin Ogier came out on top, leading McKay by a scant .33 seconds! Congratulations to one and all. Team Gotta Sets National Record, AGAIN! Team Gotta at the 2015 Wash. State. Last weekend records fell like rain at Custer Sportsmens Club. Custer’s “Team Gotta” hosted the Washington State Scholastic Pistol Program championship, drawing teams from Renton, Wash., (the Renton Steel Dragons), and Spray, Ore. (the Wheeler County Rangers). NATIONAL TEAM RECORD: Custer’s varsity group blasted past their previous mark to re-set the 4-person all-ages rimfire course record (177.65). Note that this is the all-ages course record. Team Gotta’s score out-ranks not just all the other junior and senior high school teams, but all the COLLEGE teams as well! Simultaneously, shooters at the match watched a lightning-fast, head-to-head contest between J. Castro (Team Gotta captain) and C. Sailer (Renton Steel Dragons). Sailer made history, becoming the first 16-and-under “junior” to break 40 seconds in the history of SPP (39.42). Castro also broke 40 seconds this weekend, pushing the “senior” rimfire record down to 39.12. Team Gotta fielded three teams, all of which finished in the top three, then followed up with four individual awards in the rifle side match. All told, the team earned $2,600 for the team’s endowment account. Thank you to the Potterfields, and to the MidwayUSA Foundation for creating a path for teams like these to become self-sustaining for the long term! Portland, Oregon — While the varsity team attended a Friends of the NRA benefit dinner, Team Gotta’s JV crew competed in the Man of Steel invitational in Portland, Ore. 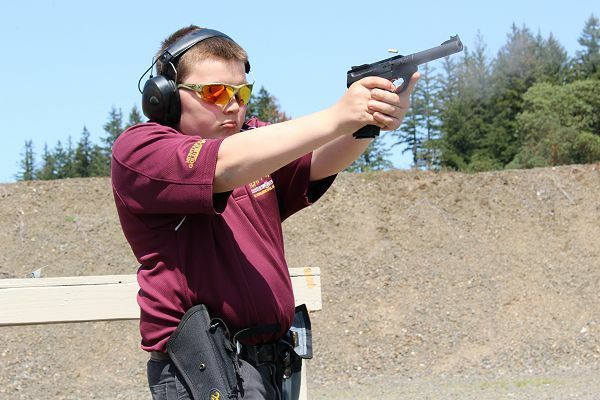 While not a team event, the MOSI match offers a chance to shoot against some of the top steel shooters in the Northwest, particularly the match directors Nick and Ryan Leonard. Stats master Alex Clark helps keep the train on the rails, leading to an excellent overall experience. While there we met up briefly with our “sister team” — the Renton Steel Dragons, and chatted with the likes of International Steel Shooting Association chief Mike Gallion. As always we had a great time — we just wish all the matches we shoot were as friendly and well-run as the Man of Steel! Team Gotta Tops at Southwest Regional — Sets New National Speed Record! Team Gotta 2014: R. Jeffcoat, Assistant Coach Tony Castro, Jordon Castro, A. Millsap, Adam Thomas, D. Harris, Keith Neher, Coach Robin Taylor. Snook, Texas, – Team Gotta flew to Texas to compete in the 2015 SW regional in February, coming home with a stack of top awards. 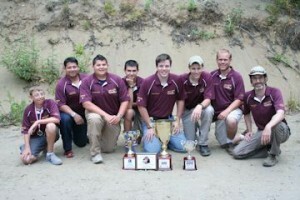 The team fielded both an “A” and a “B” squad, with the A group finishing high overall in rimfire. Adam Thomas placed first in “Senior Rimfire,” and Jake Overstreet (currently the team’s No. 4 shooter) may have set a new stage record on the stage named “Go Fast” — averaging UNDER 1.5 seconds per string. Most importantly, Team Gotta re-established itself as the fastest team in the country, posting the fastest time ever fired in the history of the sport (this includes both high school and college teams). 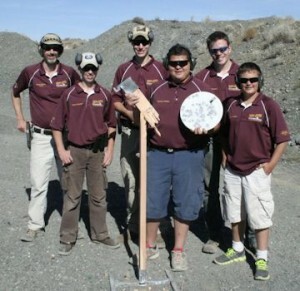 One of our two squads at Ephrata 2014, posing with the target Jordon shot off its stand (accidentally) during the match. Ephrata, Wash., – Team Gotta met up with our sister team, the Renton Steel Dragons at the ISSA Washington State Steel Championship in Ephrata in September. In typical style, the team did extremely well. Some highlights: Keith Neher won Open division, Coach Robin Taylor took second in limited, narrowly beating 18-year-old Adam Thomas. Zane Coffey took 4th overall in Iron Sight rimfire, followed a string of other strong performances by “the new guys” on the squad. This was our first experience with the brand-new ISSA (www.internationalsteelshoot.com) — and we enjoyed the format very much. Our next big event will be hosting the SPP Washington Scrimmage on Nov. 15. Adults and youth are both welcome to participate! Success At Sparta! Castro Sets SPP Record! Castro with the individual plaque, and the second-place cup. Sparta, Ill., — Team Gotta invaded new territory this year, trying out “Scholastic Pistol Program” (SPP) competition. We liked what we saw, and opted to make a run at the SPP “Senior Rimfire” title in Sparta, Ill., in July. Athletes Jordon Castro, Adam Thomas, Dan Harris III, Jake Overstreet, and Zane Coffey (alternate) made the trip, and their coaches (Robin Taylor and Tony Castro) couldn’t be happier. Castro set the course record, becoming the first SPP athlete to break the 40-second barrier (with a 39.37). Thomas came in right behind him (41 seconds). Castro took the high individual rimfire trophy, and the team’s combined score came in second behind the South Texas Juniors! Taken together, 37 teams and 328 competitors took part in the match, making this one of the largest steel matches of the year — dwarfing the Steel Challenge World Championship! Bellingham, Wash., – Today-Rainier Ballistics came through on its promise to sponsor Team Gotta again for 2014/2015. 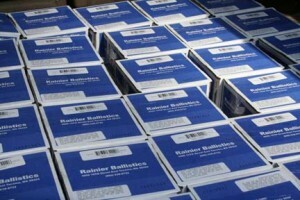 Rainier’s support was pivotal in the teams 2011/2012 SSC national championship, and at our current consumption rates their 30,000-bullet donation (on top of our existing stores which we purchased) should carry the team into 2015. The team uses the 124-grain jacketed hollowpoint made by Rainier — reloaded by the shooters themselves under adult supervision. 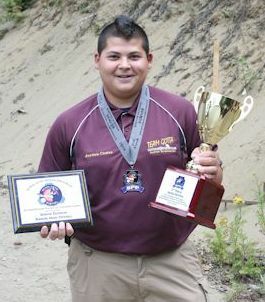 We’re sending two members to the Steel Challenge worlds this year shooting those reloads, plus full teams to the Washington Steel Challenge at Yakima, before flying to Sparta, Ill., for the SPP Junior/Senior nationals. From there, it’s off to the Washington International Steel Shooting Association event in Ephrata, and an NSSF Rimfire event in Idaho. Team Gotta at Fort Benning, holding both cups, and a check for $13,000. From left, Coach Tim Huff, Adam Thomas, Adam Rusling, Ben Huff, Keith Neher, Coach Rob Neher.